The RSPCA is searching for a very special home for a dog who was rescued from a dog fighting yard in Hertfordshire. Kali, a three-year-old Staffordshire bull terrier cross, was found cowering in a garden in Hertfordshire in March last year. She was covered in bite marks, scratches and puncture wounds which vets said were consistent with dog fighting. The RSPCA’s special operations unit launched an investigation and Kali was taken in by the charity for treatment and TLC. Over a year later, she’s finally ready to find a new home. “Poor Kali had an awful start to life,” Tiffany Saunders, who has been caring for Kali, said. 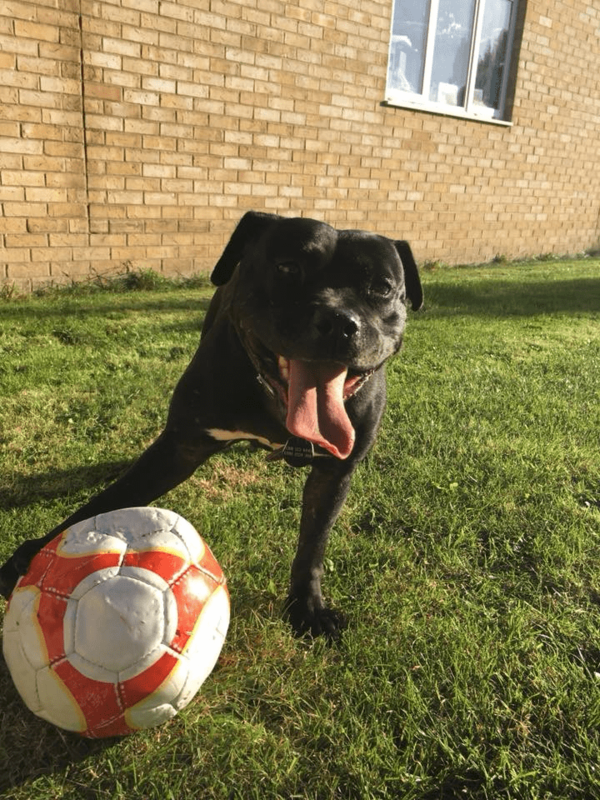 “She was in such a state when she first arrived here and had clearly been used in a fighting ring either to face off against other fighting dogs or for training. Staff at RSPCA Block Fen Animal Centre, in Cambridgeshire, have been looking after Kali for the last year while her case went through court. Everyone has fallen in love with her gentle nature and loving temperament, even after everything she has suffered. “Kali has always remained in high spirits and, even though humans have let her down so badly, she still loves everyone she meets. She loves nothing more than getting on your lap and getting some well earned cuddles,” Tiffany added. “Kali is very playful and loves her toys. Her favourite thing to do is carry a football around in her mouth. She is a big fan of being outdoors so is looking for an active family who like going for lots of long walks in the countryside. She will benefit from training classes and, as it’s thought that she’s always lived outside, will need to learn how to live in a home. She could live with older children who are used to dogs but would prefer to be the only pet. Staff would like her to go to a home where someone is around most of the day as it’ll take some time for her to learn that it’s okay to be left alone. She is incredibly energetic and playful, loves playing with toys and is always on the go so would suit an active home. For more information about Kali check out her blockfen-inbox.